This is my first post on the forum, although I have gained so much insight and knowledge from reading all of your fantastic posts. 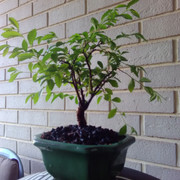 I wanted to ask a question regarding my little 6 year old Chinese elm. close to two months ago I gave it a full defoliation, since then (as the picture shows) the growth has been phenomenal although I am concerned that the growth is just all whips, with bigger leaves than before, and no real look of becoming any closer to nice ramification. 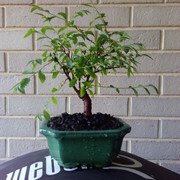 Can any of you knowledgeable bunch tell from the pictures as to what I should be doing with this little guy in the future in order to create a more structured and aesthetically pleasing tree? I am not concerned about the trunk at this stage, this will be a job for later. I'm mainly wanting to know more about styling and ramification when the tree looks like this. Shorten the longer shoots, keep 1 or 2 pairs of leaves on the new shoots. 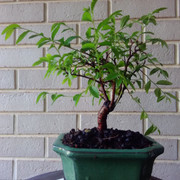 Regular tip pruning during the growing season will increase ramification. Agree with Gerard the only way is to cut back to one or two leaves and keep cutting as new shoots branch off from where you previously trimmed. Always back to one to two leaves you should see ramifications soon. I am not concerned about the trunk at this stage, this will be a job for later. Gerard and Kirky have answered your question. BUT, I may be reading this wrong - i understand you're asking for advice now on how to achieve ramification BEFORE you start working on the trunk. All the information my poor brain remembers is you ALWAYS work on the trunk first then branching / leaf size / ramification last. Last edited by Kevin on January 29th, 2019, 1:53 pm, edited 2 times in total. i assumed as much, its just that i had read somewhere that i should be waiting for the new shoots to turn woody and brown before pruning them. i didnt think that was correct. so thanks for your answers, i'll get straight on it. i also noticed that i posted this question in the wrong forum too..... evergreen?